A terrarium in an ornament or small glass vessel makes for an attractive wedding favor- and one that guests might enjoy taking home! 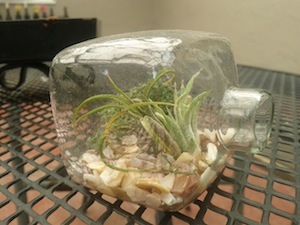 Blogger heavenlybit shares a thoughtful DIY and reflection on making the above tillandsia (air plant) terrariums as favors for her wedding guests. Oh, this is so lovely Homemade Terrarium and it is perfect as a wedding favor. Usually I have a lot of DIY gift ideas in mind but I lack decent ideas in a pinch. You have made my work easier by this idea. Actually I need to attend wedding reception of my cousin at some Malibu wedding venues and want to give him a nice wedding favor.